Most people wear 20% of their wardrobe 80% of the time. If you’re anything like me, then you’re always wishing for more closet space than you currently have. 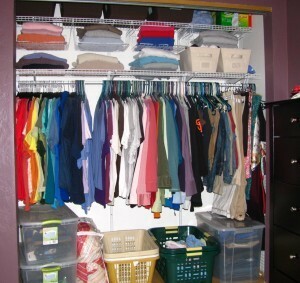 Short of tearing out a wall to increase the size of your closet — or investing in a built-in closet organizer (like Elfa Closet Solutions, Closetmaid, even Rubbermaid has a built-in closet system now) — following are some simple things you can do right now to get more space in your current closet. So first I did a little research to find some quick tips & inexpensive “cheats” that would help to maximize the space in our relatively small walk-in closet. #1 – Start from scratch. That means you need to get everything that’s in your closet… out! It’s only temporary, but you’ll need to pick a day when you can carry every single item out of your closet. TIP: While it’s bare, you may as well give it a quick vacuuming and do whatever you can to tidy up the space a bit. TIP: For my “piles” I used our King-size bed, the full-size bed in the nearby guest bedroom, and the floor in the office across the hall from our bedroom. #3 – If you’re like me, to help you decide which pile certain garments belong in, you may need to take the time to try things on — to make sure they still fit. If something doesn’t fit exactly as it should right now, but you are 100% certain that it will fit fine very soon, then you should put that item in the “Special Occasions” pile. TIP: Do yourself a favor… You need to be brutally honest during this process. Be very selective about the things you cannot currently fit in but still wish to keep. Besides, the more room you clear out, the more room you’ll have to buy NEW things that do fit! #4 – Once each and every item has been assigned to a category, then you need to determine exactly where you will be storing the items you’ve earmarked ‘Special Occasions’. One thing’s for sure: such items do NOT belong in your closet that’s filled with daily apparel. TIP: Consider devoting a closet in a spare bedroom for this purpose, or designate some space in the attic or the basement. You may even want to consider plastic storage boxes or canvas garment boxes that will be stored underneath a bed, or maybe even a free-standing garment rack & shoe organizer like this one. TIP: Stick to your guns. Don’t talk yourself into switching piles at the last minute. Like with most things, your first instinct is always the best choice! And, don’t allow any non-clothing items back in the closet. No suitcases. No vacuum cleaners. No coats. No boxes, bags or linens. These things all belong elsewhere. Yes, Organizing Things Can Be FUN! Cleaning out the closet is such a cleansing, uplifting thing to do. It is just one of the many ways that we can all rid ourselves of “junk” and things we no longer want, need, or even like anymore. If you haven’t got the time for a big project like your master bedroom closet, then consider trying your hand at cleaning out the coat closet first. I know our coat closet has become more of “a junk drawer for tall stuff,” and I’m probably not alone on this one! And what’s the alternative?… Yes, you could pay someone to do it for you …at a price of $250 for the initial consultation, plus $200/hr and 20% commission on supplies! Still have questions?… Ask a professional organizer!